Updated on 10 Feb. 2017. 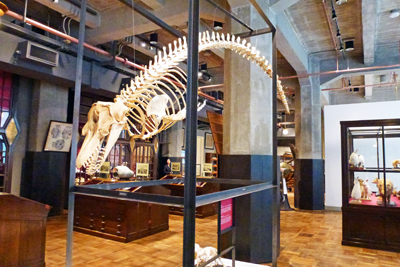 The Intermediatheque is a museum jointly operated by Japan Post and the University Museum, the University of Tokyo. Professor Kohno and UT Math. contributes some Mathematical Models to this museum. (1) Shin Maru Building 7F Terrasse (free) --- if the weather is good. The glass atrium may be the most well-known symbol of TIF. We can walk spiral walkway that runs along its glass-and-steel walls. (3) Yaesu Shoping cener B1F , in the other side Yaesu of the station. Its underground floor is Souvenir shops "Kobiki-cho". 17:30--18:15 Come back to Komaba, by Subway.